Franklin H. Ernst Jr., M.D. There are four major classes of outcomes which result from social encounters. The four classes are called Get-On-With (GOW), Get-Rid-Of (GRO), Get-Away-From (GAF), Get-Nowhere-With (GNW). They are shown in the artwork at "OK Corral: Grid for What's Happening." The Get-On-With (GOW) outcome of a social encounter occurs when the personal experience of the particular person closeswith an I-Am-OK and You-Are-OK. The Get-Rid-Of (GRO) outcome of a social encounter occurs when the personal experience of the particular person closes with an I-Am-OK and You-Are-Not-OK. The Get-Away-From (GAF) outcome of a social encounter occurs when the personal experience of the particular person closes with I-Am-Not-OK and You-Are-OK. 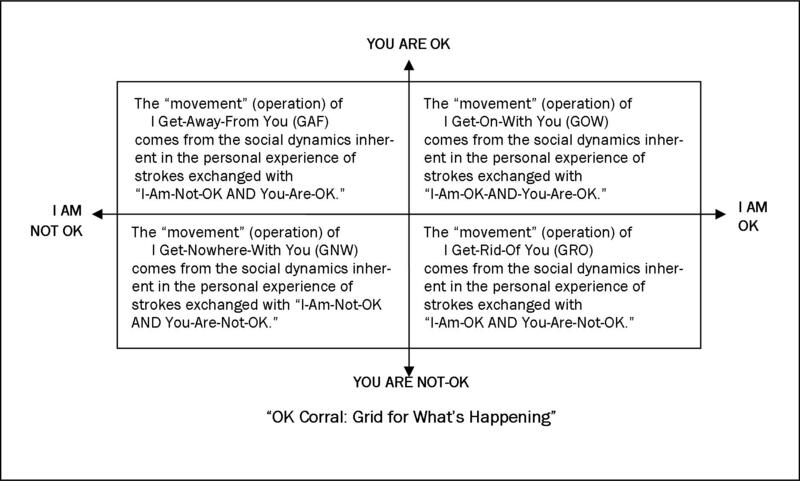 The Get-Nowhere-With (GNW) occurs when the personal experience of the particular person closes with I-Am-Not-OK and You-Are-Not-OK.
By placing "I Am OK" and "I Am not-OK" on the ends of a horizontal line AND the ""You Are OK" and "You Are not-OK" at the ends of a vertical line we have drawn the grid for the outcomes of personal experience. This is an informational web site dedicated to educating visitors to various topics such as the The "OK Corral: Grid for What's Happening", the activity of listening, games people play, transactional analysis, and the alphabet of behavior. 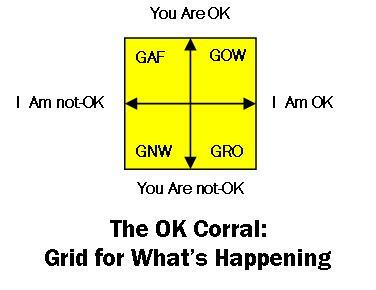 The "OK Corral: Grid for What's Happening" and other topics are described in several publications, written by Franklin H. Ernst Jr., M.D. They are available here for your viewing and usage. Art work, drawings, and diagrams are also available for your viewing and usage. Encounterer - - - - - - - Franklin H. Ernst Jr., M.D. Copying of publications and diagrams for non-commercial purposes is authorized. Permission to use, to copy granted when source credited. Permission is hereby granted to any person, magazine, newspaper, other periodical, or media to reprint any monograph or art work in any single issue of the periodical in question, so long as two conditions are met: (1) the monograph or art work is printed word for word, including diagrams, figures, and footnotes, and (2) the following reference is given at the bottom of the first page on which the reprinted article begins: "This article is taken from (name of title, author's name); published by Franklin "Harry" Ernst III, Addresso'Set Publications, P.O. Box 3009, Vallejo, California, 94590, USA."